Sit me down in a pub when the doors first open and ask me about TV commercials that annoy me and I'll still be ranting when we're tossed out at closing time. One that particularly irritates me at the moment is a long-running ad for Specsavers (a company with a history of crappy TV commercials, I should add), one that passes judgement on your intelligence as it attempts to pick your pocket. It consists of a famous French singer delivering one of her most celebrated numbers in her native language and subtitled in English. Except that halfway through the piece the subs try to convince us that what she's actually regretting is that she didn't go to Specsavers. Get their underlying message? She's singing in French and they can change the words because as far as they are concerned someone like you is never going to understand what she's really singing about, you gullible thickie. It's particularly insulting because the singer in question is Edith Piaf and the song is the fabulous Non, je ne regrette rien. I'd like to believe that if Piaf were still alive she'd have told them to take a running jump when they asked if they could use the footage. Not that this is the first time this extraordinary song has been used to hock useless wares, of course – eBay, Hitachi and Heineken have all ridden on its back. This should, at least, serve as an indication of the fame of this particular tune. If the name Edith Piaf means nothing to you then I'm guessing you're young enough to have not yet fully spread your wings of musical appreciation. That doesn't mean you'll instantly take to her songs the moment you hear them – let's make some allowances for musical taste here – but you'll sure as hell remember her voice. Her rags-to-riches story is the stuff of musical biopics and melodrama cliché – she actually lived the sort of life that Hollywood builds movies around, and had she been born in the USA then I can guarantee Tinsel Town would have long ago immortalised her story on celluloid. That such a work, when it finally appeared, was a product of the film industry of the country of her birth is rather heartening, and La Vie en Rose (the original French La Môme was seen as being too obscure for an international audience less familiar with Piaf's life) not only landed an Oscar win for Marion Cotillard's superb central performance, and another for the make-up, it brought the songs and voice of Edith Piaf back into public consciousness. Hence that bloody Specsavers ad. And hence this useful 2-disc DVD release from Acorn Media. Piaf was born Édith Giovanna Gassion in Belville in 1915, the daughter of café singer Annetta Maillard and street acrobat Louis-Alphonse Gassion. Abandoned by both parents at an early age, she was eventually placed in the care of her paternal grandmother, who ran a Normandy brothel whose prostitutes cared for the young Edith and regarded her almost as a mascot. At the age of three she went blind and her sight was miraculously (and I choose that term in its religious sense) restored during a pilgrimage to honour Sainte Thérèse de Lisieux. I should point out here that this particular moment in her life remains clouded in uncertainty and what we do know of it appears to have been shaped at least partly by Piaf herself. She began living on the streets and singing for the coins of the passing public with her close friend Simone Berteaut (known as Mômone). At 16 she fell in love and at 17 she gave birth to a daughter, who two years later died of meningitis. Her next boyfriend Albert was a pimp, a relationship that was ended by Edith when her close friend Nadia killed herself rather than work as a prostitute. Albert's response was to try to shoot her. Seriously, if you were a Hollywood screenwriter, what could you possibly add to make this more dramatic? But there's more. In 1935 Piaf was singing on the streets in the Pigalle area of Paris when she was spotted by night club owner Louis Leplée, who convinced her to sing at his venue. It was he who effectively created the stage persona for which she would become famous, transforming Édith Gassion into 'La Môme Piaf' ('The Little Sparrow', chosen because of her combination of small stature and powerful voice). Her opening night was heavily publicised and attended by public and celebrities alike. The rest, as they say, is history. Except the drama doesn't stop here, not by a long shot, but in the spirit of not completely spoiling the plot for newcomers, I'll leave that to the documentary on this dual-DVD set. Safe to say that Piaf went on to huge success both on home turf and in America and is even today widely regarded as the greatest of all French singers. Her songs were written specifically for her by trusted and loyal associates, although one of her most celebrated – La Vie en rose – was completely her own composition. 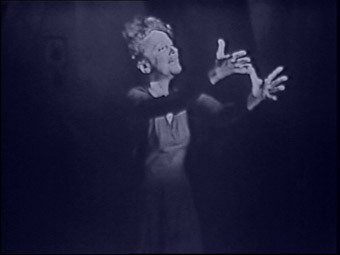 Key to her success was that these songs were often perfectly matched to her unique singing voice – its controlled, pitch-perfect power, expressive delivery, held vibrato and rolled 'R's are instantly identifiable and seemingly at odds with the small, sometimes frail-looking woman from whom they escaped. The 2-disc DVD under review here looks back at both the music and the life of this French cultural icon. Disc 1 contains Edith Piaf: The Perfect Concert (51:04), which is not a concert as such, but compilation of footage from a variety of sources of Piaf performing some of her best known songs, including L'Hymne à l'amour, La Vie en rose, Mon Dieu and, of course, Non, je ne regrette rien, each introduced with a concert programme or record cover accompanied by a relevant sound bite from Piaf herself. The only cheat involves Mon Manège à moi, which is audio only and set to some of Piaf's colour home movies, but these are a delight in themselves (she always appears to be deliriously happy here) and the sequence usefully breaks up the monochrome extracts that surround it. In essence an audio-visual Greatest Hits collection, The Perfect Concert scores over a CD of the same through Piaf's considerable stage presence and her passionate delivery – her performance of Fait pas qu'il se figure on a 1959 TV show hosted by Annie Girardot feels wrenched from the very depths of her soul and projected forth as if her life depended on our understanding of its importance to her. Two of the songs are presented both in their original French and their English language versions (performed on the Ed Sullivan show). In the case of the gorgeous L'Hymne à l'amour the difference is greater than you might expect, with the French original, performed solo in an extract from the 1952 feature film Holiday in Paris, having the sort of emotional wallop that has the power to make grown men go watery-eyed (well, this one anyway), an effect that is seriously diluted in the Ed Sullivan Show performance by a choir of intrusively cooing backing singers. The collection serves its purpose well as an introduction to Piaf's awesome repertoire, and I'm willing to bet that those who believe they are coming newly to the singer's work will be surprised at just how many songs they recognise. It's also valuable in making available in one set a number of recorded performances that might otherwise be consigned to TV studio and film vaults, from which they'd be released only for partial incorporation in documentary works. It's worth noting that Non, je ne regrette rien is compiled from three different performances (including the one used in that ad) – in an ideal world I'd liked to see all three in their entirety, but I'm happy enough with what's here. One complaint I will make, though, is the lack of English subtitles on the songs themselves – given the importance of their meaning to Piaf, it would have been nice to provide non-French speakers with the opportunity to appreciate the words as well as the tunes they are set to. 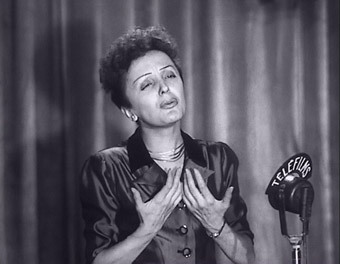 Disc 2 contains the documentary Piaf: "Sans amour, on n'est rien du tout" [Piaf: "Without love, we're nothing at all"], a production whose bilingual captions suggest it was originally targeted at both French and German speaking markets. It begins in entrancing fashion with the patrons and the owner of a French café-bar taking it in turns to sing a few lines from Piaf's Mon Manège à moi – the owner even continues to sing as she answers the phone to a presumably bemused caller. It is she who neatly sums up the content and appeal of Piaf's work: "Her songs are about life and love, the vagaries of life, unhappiness in love, unhappiness in life, and so I believe that everyone can recognise themselves in her songs." The film that unfolds is a straightforwardly structured but content-rich tribute to Piaf's life and career. 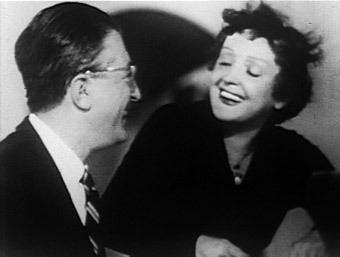 If you're coming to the film from La Vie en Rose, which inevitably covers much of the same ground but from a dramatic viewpoint, there is still much here that will enthrall, particularly in the archive stills and footage of Piaf either performing, in interview or – best of all – caught off-guard in home movies. The press material of Piaf is also revealing – I, for one, had found it hard to believe that she and her colleagues would be paraded before the press in such a public location so soon after the killing of Louis Leplée, as they were in La Vie en Rose, and yet included here is the actual press footage of the event. This both confirms the authenticity of the movie recreation and leaves you sad for the insensitivity shown to her at a time of genuine trauma – as Piaf buries her face in her hands and proclaims that she has no friends now and begs to be left alone, the cameras just keep on rolling. Equally valuable are the interviews with surviving friends and associates, particularly Simone Berteaut, who provides an insider's view of Piaf's early life and relationships with men (she says of her friend's one-time boyfriend Paul Meurisse that "He wasn't even a man, he was a thing"), and admits to having faked ouija board messages from the departed to prompt Edith's return to health. It's this busy blend of story, interview and fascinating archive material – the early footage of Piaf and songwriter Michel Emer performing and clowning with each other is a joy – that makes this worthy viewing for Piaf fans and newcomers alike. Its reverential approach does prompt the occasional double-take, however, as with the claim that Paif herself wrote the lyrics for Non, je ne regrette rien, which as far as I was aware have always been credited to Michel Vaucaire. Optional (and thoughtfully positioned) English subtitles are provided for everything except, once again, the song lyrics. Usefully, the disc is chaptered by the songs. Programmes consisting primarily of archival footage are sometimes difficult to judge on this score, given that much of the material is in imperfect shape and that costly restoration work is unlikely to have taken place. Even the interview footage varies in quality enough to suggest that some of this was sourced rather than shot specifically for the film. The stills are all crisply reproduced, though, and the best quality footage (the Gaumont archival shots of Paris streets in the documentary, the extract from Holiday in Paris in the concert) is impressive, with spot-on contrast and black levels and a very good level of sharpness. On the whole, no complaints – the material looks exactly as you'd expect it to and the transfer has certainly added no problems of its own. Dust and damage are, with notable exceptions, minimal. Obviously the soundtrack varies in line with the picture, depending on the age and the source material. The surprise is just how clear much of the musical material is – the image may not have been up to much in places, but trouble was always taken to get the best possible sound, unless some careful soundtrack replacement has taken place (and matching the sound of one live musical performance to the visuals of another is no easy task I can assure you). The soundtrack is, inevitably, Dolby mono 2.0 on both discs. Nothing here, unless you want to argue that the documentary is an extra feature to the concert or vice versa. Whether you're an Edith Piaf fan, new her music or have discovered her through La Vie en Rose and are keen to know more, this package fits the bill well. The documentary, although somewhat reverential and occasionally a little unsure of its facts, is brimming with interesting material, and the footage of Piaf performing is a precious thing in itself. Recommended.